I was having dinner with a friend of mine last week and for the appetizer we shared a plate of Korean Hot Wings. Now I have had plenty of hot wings in the past but these were off the charts good. I found myself thinking about this sauce for days after eating the wings from Earl’s. So, I decided to try my hand at recreating this wonderfully sweet, savory, and spicy Korean red pepper sauce. I have posted a lot of chicken wing recipes lately and needed a vehicle for this sauce other than wings. I decided the perfect canvass for this sauce was spare ribs! Now sit back, grab an ice cold Hite Pale Lager, and enjoy this post for Smoked Spicy Korean Spare Ribs. To get that balance of sweet and spicy I had to start with Gochujang red pepper paste. This pungent paste is a staple of Korean cuisine and would be the foundation of my sauce. Next step was finding the right balance of the other ingredients I used for this sauce: rice vinegar, ketchup, soy sauce, honey, Korean rice wine, hoison sauce, white pepper, fresh ginger, and garlic. After mixing the ingredients in to a thick BBQ sauce I prepped the rack of spare ribs and covered them with Sucklebusters SPG (Salt, Pepper, Garlic) rub. I wanted to keep the spice mixture simple so it would not compete with the BBQ sauce. I setup my large Big Green Egg for indirect cooking using the Conveggerator and a drip pan filled with water. The temp for the first part of this cook was set to 250° and I used one chunk of hickory for the smoke. I placed the ribs in the BGE and let them smoke for 3 hours at 250°. At the 3 hour mark I pulled the ribs, placed them meat side down on foil, added some pats of butter, and a 1/4 cup of beer. I sealed the ribs and put them back in the BGE for an hour at 250°. After an hour in the foil the ribs were nice and tender. It was time to remove them from the foil, glaze them with the Korean BBQ sauce, and put them back in for an hour at 300° to form that crust. Once the ribs were in for an hour at 300° I checked to see how they looked and felt. The meat was pulled nicely from the bones and I was able to put a toothpick in with little resistance. It was now time to pull, slice, and serve. I served the ribs with kimchi and sticky rice for the full Korean experience. This was an excellent meal and one you should try for yourself. This sauce will be used on wings next… that I can promise you! 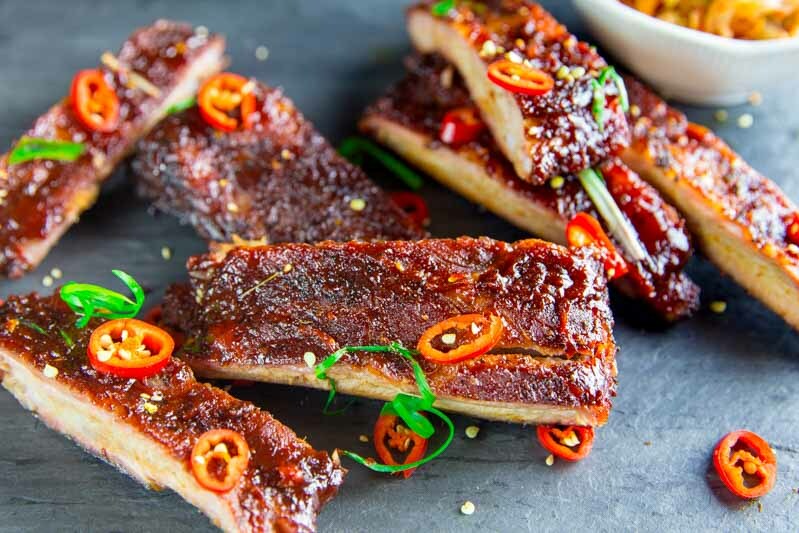 This recipe for smoked spicy Korean spare ribs is so delicious you will wish you had more when they are gone. Sweet and savory with the right amount of heat these ribs are fantastic. Mix all the ingredients together except the ribs and salt, pepper. Set the BBQ sauce in the refrigerator. Remove the membrane from the ribs and trim excess fat. Cover the ribs in a salt & pepper mix or use Sucklebusters SPG rub. Light the Big Green Egg and set temp to 250°. Add a chunk of hickory wood. Place the plate setter in the BGE for indirect cooking with a drip pan full of water. When you see the thin blue smoke coming from the BGE it is time to put in the ribs (bone side down). Cook the ribs at 250° for 3 hours. Pull the ribs out and place them meat side down on a sheet of aluminum foil. Place pats of butter and add a ¼ cup of liquid (I used beer for this cook). Cover the ribs in the foil and place back in the BGE for an hour. Remove the ribs from the foil, raise the temp in the BGE to 300°. Glaze the ribs with the Korean BBQ sauce and place them back in the BGE for an hour. When you see the meat pull from the bone it is time to remove them and serve.